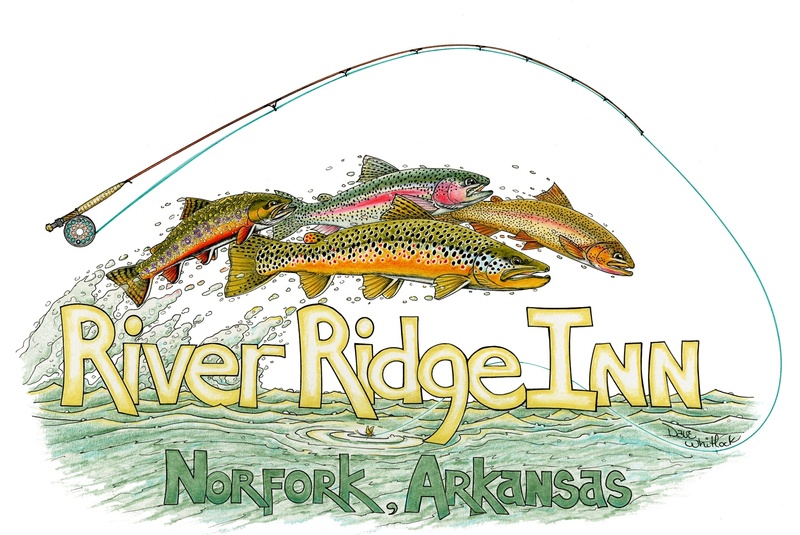 Whether you spend the day or night fishing for the new world record Brown Trout, a record Striper on Lake Norfork, or hiking the many trails in the Ozark National Forest, you know you can come back to the Inn where you have the comforts of home and the amenities of a Premier Resort. If you chose one of the cottages or new chalets, you will be relaxing in the total solitude while enjoying all the private comforts of a home away from home. Be WHERE the Action is.. Be ON the Water...Ready to FISH!! On occasion, someone may elect to "stay back" and enjoy the many professionally landscaped gardens or to simply sit on one of the swings and just watch the water go by. If the choice is to stay inside in the cool air conditioned Lodge, Chalets or Cottages, you can enjoy satellite TV in your room, or you can relax in our newly decorated 1000 sq. ft. lounge with its big screen TV, Satellite receiver, DVD/VHS and surround sound system so you won’t miss that big game, or to simply catch up on reading or view a movie from our inventory. You may just want to relax on the dock or on your deck and watch the full moom rise over the mountain and shine it's moon beams on the rippling water and stony moss covered shoals that are part the North Fork River. Listening to the sound of the water running over the shoal and down the run will provide you with an experience that will linger in your mind. On a hot summer night, when the fog sets in over the surface of the water, you may find that you would be more comfortable with a sweat shirt or jacket. It is not unusual for the temperature to be 10 to 15 degrees cooler on the dock than it is just 15 feet up the bank. During the daytime, our guests find it very relaxing to walk to the waters edge, or to sit on the dock, where it is always cooler than what it is on your private deck at the Inn. Think for a minute about the advantages of staying in accommodations that are located right on one of our most heralded Trout fishing rivers in the World. Day or night, you have total access to nearly one mile of North Fork River Frontage. You do not need a guide if you are experienced in fishing tail waters, but if you would like to learn fly fishing, or to just hone up on the many skills that can be acquired, then we have the best Fly Fishing Instructor/Guides in Arkansas at your call. Does it really make sense to travel as far as you have and not be able to walk off the property into the water at your leisure? River Ridge Inn offers this to you. It has 1 mile of frontage that is available to our guest for walking-in to wade fish. Natural stone stairs are spaced out along the bank for emergency exit to avoid fishermen being caught in the rising tailwaters. Many a fly fisherman has found that walking into the river, right in front of the property where the first run and pool are, is as productive as any part of the White and North Fork. Often, many of our guests have fished in front of the dock and our meadow, and have never moved 50 yds all day. Reports are of 50 fish caught in the morning and 50 in the afternoon, and,that is without a guide. The North Fork can fish better than any river in the Ozarks and the South. Enjoy the other amenities at the Inn. Take a sauna, or maintain your exercise routine in our well equipped exercise room, soak in the Hot Springs Hot Tub or, cooking out on one of the grills or smokers located at the riverside pavilion or on the 900 sq. ft. patio. Each cottage and chalet provides you with a choice of charcoal and gas grills. Your hosts, Jim and Liz Smith, come from corporate backgrounds and know what stressful environments they can be. Moreover, they know and understand what it takes to “get away from it all”. Many businesses allow for a little play while they work. River Ridge Inn has been set up with this in mind. The accommodations lend themselves to accomplishing both. Whether you play in the A.M. or in the P.M., the facilities at the Inn will be ready. Liz and Jim know that timing and planning of events around your work time is extremely important. Give us a chance to make your work more productive and your mind and body more at ease. Thank you for visiting our Web Site. Please look the rest of it over and give us your opinion. More importantly, schedule your next “get away” with us. We promise to give you the mix of attention and privacy that you are looking for from something more than a Bed & Breakfast. Some of our guest have slipped away from the rigors of work but find it necessary to periodically “check in”. For those times we offer a work station consisting of a fax, computer, WiFi high speed internet, phone line, copier and scanner.